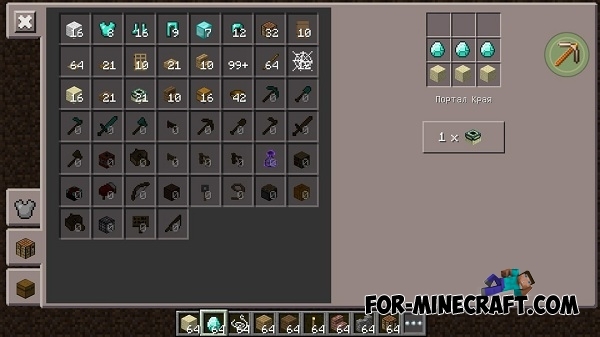 I'm sure many players would like to developers finally added crafting recipes for the various blocks and items that can be obtained only in the creative. With Elementary Crafting mod you will be able to use recipes of the some items from the creative mode. Now, you will be able to craft the bedrock, the nether portal, the spider web, spawners, and experience potion even! Each block is useful in its own way but each of them has advantages and disadvantages. However, the recipes of these items are quite difficult, so do not think you can get them right away. But still I would recommend you install Elementary Crafting mod for MCPE 0.15, because now you have all the available items.